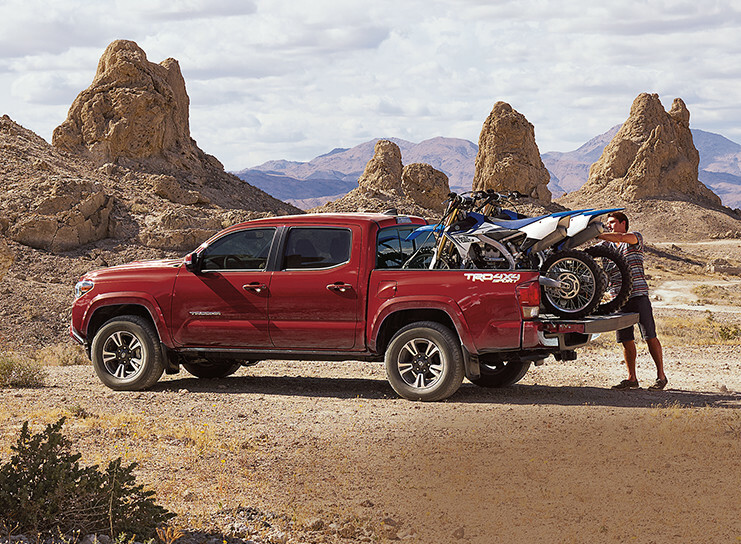 Plan your adventure around the incredible durability and legacy of the 2018 Toyota Tacoma. Through four doors and seating for up to five individuals, this powerhouse is ready for work or play and everything in between. Available trim levels include the 4×2 Access Cab, 4×4 Access Cab 6A, 4×4 Access Cab V6 6A, 4×4 Access Cab V6 6M, 4×4 Double Cab V6 6M SB, 4×4 Double Cab V6 6A SB, 4×4 Double Cab V6 6A, and the 4×4 Double Cab V6 Limited SB. Take on more as your surround yourself with the modern and intuitive design of the 2018 Toyota Tacoma. Featuring a range of luxurious features and enhancements, this vehicle proposes that you can deliver performance without sacrificing comfort. Relax on the available heated front seats as a combat to chilly days while refinement greets you through features such as the available leather-wrapped shift knob. Keep your front passenger satisfied through the optional Dual-Zone Automatic Climate Control as you set and maintain two different front temperatures at the same time. Grip the available 4-spoke leather-wrapped steering wheel with its innovative comfort as the mounted controls deliver access to your settings without distraction. 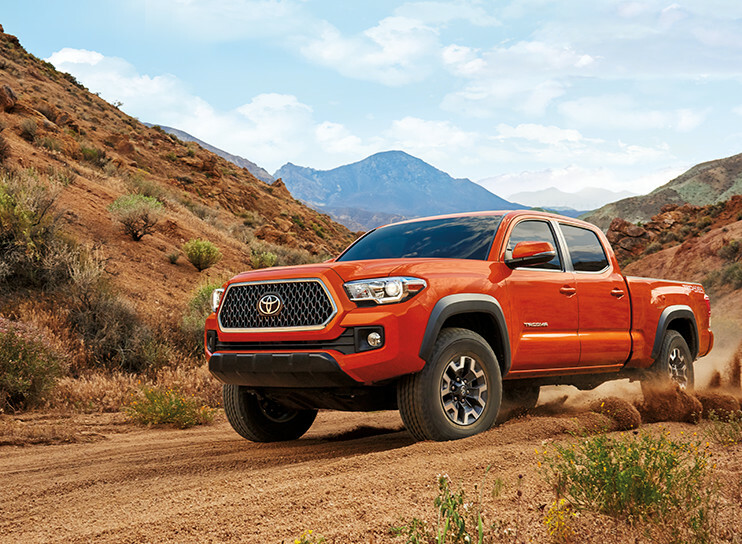 On the outside, the 2018 Toyota Tacoma presents a bold approach to capability with a durable structure and functional amenities. Draw attention through details such as the available black grille surround and optional hood scoop as the available chrome outside mirrors enhance driver visibility. Increase your cargo loading abilities through the optional removable locking tailgate as available cargo bed tie downs offer a range of options for securing your load. 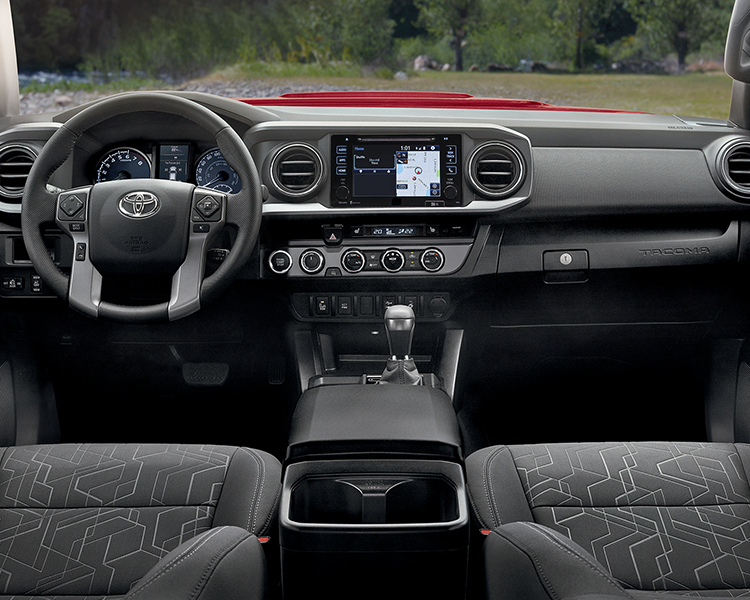 Advanced technology has been included in the design of the 2018 Toyota Tacoma as you drive with advanced communication capabilities. Featuring an optional 7″ touchscreen display audio system as well as Bluetooth capability, this vehicle allows you to connect to your compatible devices for hands-free calling and more. You are also given advanced voice recognition to enhanced your hands-free access. Experience the beauty of customization with the 2018 Toyota Tacoma as a series of Genuine Toyota Parts and Accessories bring you versatile options for performance and style. With the addition of features such as all season floor mats, you can increase interior protection and style. Bring home the bacon like never before as you drive the incredibly durable 2018 Toyota Tacoma. Featuring available part-time 4WD and two engine options, this truck delivers enhanced power and control. Responsive handling is promoted through the available 6-speed manual or automatic super electronically controlled transmission as you enjoy adaptive control in a range of conditions. Lighten up and hunker down as you experience the wide range of possibilities with the 2018 Toyota Tacoma. Versatile design and effortless power come together to enhance your day job and elevate your adventures. Explore the 2018 Toyota Tacoma at your local Edmonton Toyota Dealer – Gateway Toyota! Through a wide selection of durable trucks, Gateway Toyota is proud to be your one-stop shop for all things automotive!